Well, work on book 2 is well underway, 46 pages down, 150 to go 🙂 The title you say? Wait and see! In October 2014 I submitted my final manuscript for a motorcycle restoration book to Motorbooks International for publication. The final few months were busy and full on trying to finish it by the deadline, nearly a year later its on the book shelves! As soon as I received book #1 I found errors, some are layout errors but on pages 175 and 176 the block diagrams of the charging system are wrong, the earth is shown as (+) but should be negative and the (-) terminal should be positive! and its on 3 pictures! I will make sure they fix this on the next print run. I also found a cover photo is described as a “Honda z1”, but this should be “Kawasaki Z1”. I will also put an errata section on the main web site. The book is now available world-wide. The book is in final layout stage prior to me approving it for publication. Final chapter assembly and photography is in progress for October deadline. June 2014 Update – The book will be published by Motorbooks in Spring 2015. I will be placing links to eBook versions here and to both the Publishers site and Amazon.com when they become available. This article very much interests me I would like to know how to tell if the crank is twisted as my GPZ doesn’t seem to go as well as it used to the motor has been rebuilt about ten years but only 8000kms ago. Pehaps the answer is in chapter 9. The quickest way to check if the crank is twisted is to measure the piston heights, you will need a dial gauge and a long rod to stick down the spark plug hole. If the crank is twisted the pistons where the twist is occurring will not reach TDC at the same time, if you have the head off then you can place the dial gauge directly onto the pistons as they reach TDC and all should be within a set range as specified in the service manual. By the way do you have a service manual? They do come up on eBay every now and then and are worth getting as all the measurements for checking every aspect of the motor are present. We’re looking for GPz1100 owner/restorers for our regular restorers tips feature in the next issue of Practical Sports Bikes. It would involve an email ‘interview’ and you supplying a high res photo of you and your bike to go with your words of wisdom. I’d send you some questions and notes, which hopefully would give you a better idea of what we’re after. Uni-Trak wisdom would be particularly welcome! Many thanks for any help you may be able to give. I look forward to hearing from some of you. Very nice Job! – I like the rear caliper and the bike as a whole.. well done! 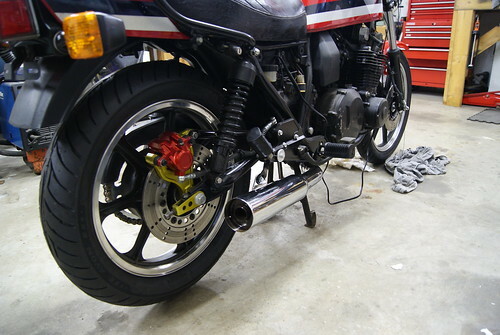 Thanks, I am still waiting for the front calipers and mounting brackets to come back from Powder coating. First ride will be in a week or so !!! Very nice, I bought a B1 today running condition. Looking forward to start the work. Was driving a B1 in 1984, and eversince regret that I sold it ! Very interested in any chapter you might send me, will buy the book when it comes! I can proudly say its with a publisher and we are working on getting it ready for publication. Hi, I’m entering the world of restoration for the first time. 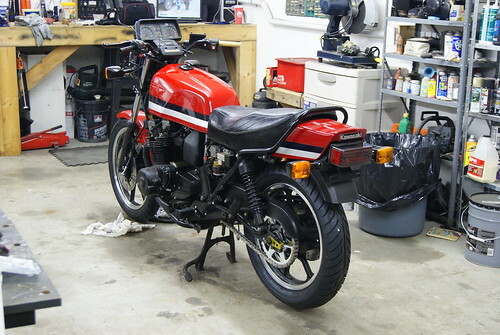 I got my hands on a 1979 z400 on which I plan to a frame up restoration. I have just finished setting up my shop and buying tools. I wonder if the rest of your book is available for reading online. Thanks. The book is currently being evaluated by a publisher and when the outcome of that is determined then I will know if I will have it professionally published or self-published.